All transactions are safe and secure with a reliable history in online purchasing behind each of our associates. 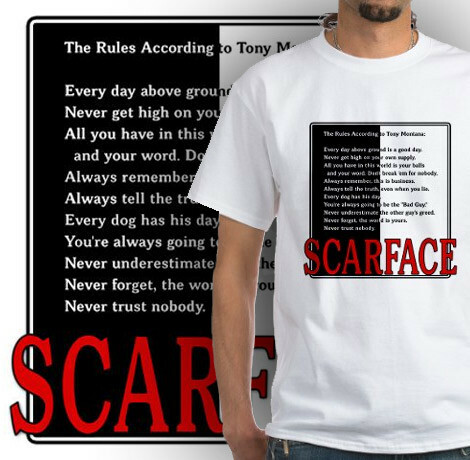 Buy the Scarface Rules t-shirt to own Scarface clothing and merchandise. This white tee features Tony Montana rules to live by from the Scarface movie. Wear this T and obey the Scarface rules, which go as follows: 1. Everyday above ground is a good day. 2. All you have in this world is your balls and your word. Don't break 'em for nobody. 3. Never get high on your own supply. 4. Always remember, this is business. 5. Always tell the truth, even when you lie. 6. Every dog has his day. 7. You're always going to be the 'Bad Guy'. 8. Never underestimate the other guy's greed. 9. Never forget, the world is yours. 10. Never trust nobody. In addition to the Scarface Rules tee above, browse the Scarface Clothing Gallery for more apparel like men's and women's clothes, kids shirts or hoodies.